Here are a few ornamental garden fence ideas if you want to contain your garden and keep out unwanted pests! These examples show plans and ideas for creating an attractive vegetable garden fence. Garden fences can also serve the purpose of offering some protection during windy weather, and can offer climbing plants a built-in trellis. An attractive garden fence also offers some cover during the less attractive stages of vegetable gardening. If you are handy at do-it-yourself projects, building a fence for your garden can be a fun weekend project. When many gardeners envision a decorative garden fence, it reminds them of the typical English gardens. Often made from aluminum or wrought iron, the decorative fences provide a backdrop to show off your eye-pleasing and tasteful garden fence. Surrounding your property is a good idea if you have a problem with encroaching neighbors such as deer or wild hogs. Make certain the fence is of sufficient height and designed with the pickets close enough to keep the type of wild animals known to roam in your area out. 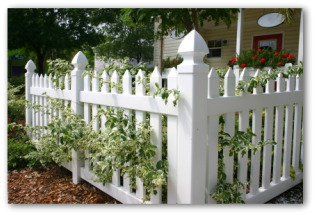 Many ornamental fences are decorated with pointed picket tops that serve a dual purpose of discouraging would be intruders from climbing over the fence. Picket tops are normally recommended for fences over six feet high for safety reasons. 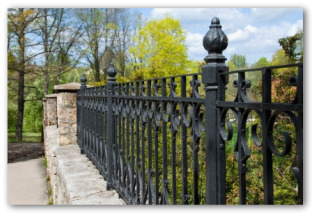 Wrought iron is an ideal choice for an ornamental garden fence because it offers structural strength along with allowing the ability to see outward. At the same time, you are not completely blocking your neighbors or passers-by from seeing the garden space you are creating. It can also partition your property from adjoining properties, or divide one section of your land from another. There are many types of wooden garden fences that have a decorative purpose as well as securing your garden. 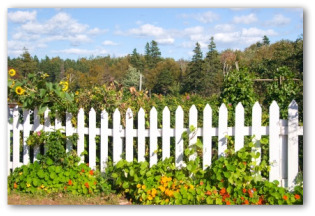 These can be traditional white picket fences, lattice, or wooden boards fastened to posts. Many traditional wooden fences have been replicated using low maintenance vinyl material. These are a great way to eliminate the need for re-painting or staining fence boards. A visit to your local home improvement center will reveal the many ornamental fencing options available. Another idea for designing a distinctive ornamental garden fence is maintaining evergreen hedges around the area. Surround a gardening spot using a hedge and install a wooden garden gate underneath an arbor or trellis to make a beautiful entranceway. Evergreen hedges are living year-round features of the landscape. A close-set row of bushes with the branches intertwined forms a practical garden barrier or boundary to protect against loss. In addition, a hedge helps guard against erosion, provides a habitat for birds and bees, and serves as a natural background for the garden. The hedge may be a formidable row of tall-growing trees, a head-high wall, or a short divider in the yard. You want hedges to grow thick, dense foliage that will be easy to trim into a desired shape or size. Types of hedges include slow-growing evergreen species, cypress varieties that yield a thick, fast growing hedge, boxwood, and many fir species. They need average garden soil and plenty of sunshine. Watered regularly while they are young, hedge plants usually require no watering once established. Medieval vegetable gardening practices included planting kitchen gardens, cemetery orchards, vineyards, and medicinal herb plots. Frequently, the plot was surrounded with fencing that prevented unwanted animals from straying inside and helping themselves to the produce. Now days, an ornamental garden fence serves the same purpose of security as well as providing a pleasing view. 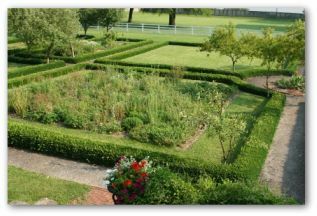 In medieval times, the garden was laid out in rectangular beds with pathways between them, which simplified harvesting. Then as now, if space allowed, cabbage, leeks, parsnips, fennel, onions, garlic, peas, radishes, and beans were grown for cooking purposes. Herbal remedies for illness included: savory, rosemary, rue, peppermint, sage, mint, and cumin. Stone walls and living hedges offered protection from weather and garden pests alike. Stone garden walls also retained heat, and offered a lovely backdrop for climbing vegetables and ornamental plants such as roses. Following the devastating Black Death of the mid-fourteenth century, which wiped out about a third of Europe's population, there were an insufficient number of peasants to work the landowners' gardens. To prevent a food shortage, landlords leased small plots of land to tenant farmers so they could grow their own produce. Historians claim that this practice led to the invention of the famous English cottage garden.